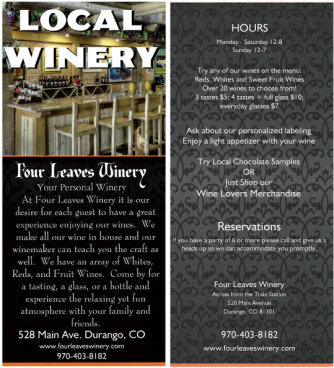 Durango's only full-production winery, Four Leaves Winery prides itself in presenting wine as both an enjoyable indulgence and a shareable craft. Importing grapes from around the globe, we ferment, blend, and bottle our wines in-house for all to enjoy. This fascinating process puts you directly in touch from start to sippable end. Join us in our tasting room, open daily, to experience our wide selection of fine wines! We allow you to blend your own wine as well, providing you with a personalized batch of your very own to enjoy and gift your friends, family, or coworkers. Fancy yourself a V.ery I.mportant P.erson? So do we! VIP members pay a one-time membership fee and enjoy half priced glasses of wine and 20% of all wine purchases. Additionally, Four Leaves releases three different specialty wines on three occasions each year (nine specialty wines total) and our VIPs get front row access. With your card on file, we automatically reserve a bottle of each special release for you, along with an invitation to our VIP release party where you can pick them up! Not able to attend? We'll help arrange a time for you to come by for them or have them mailed to you. Our beautiful downtown boutique is the perfect place to host your event, whether for weddings, holidays, parties, or corporate programs. With storefront access to the action downtown, there really isn’t a more ready and refined place to organize your event.